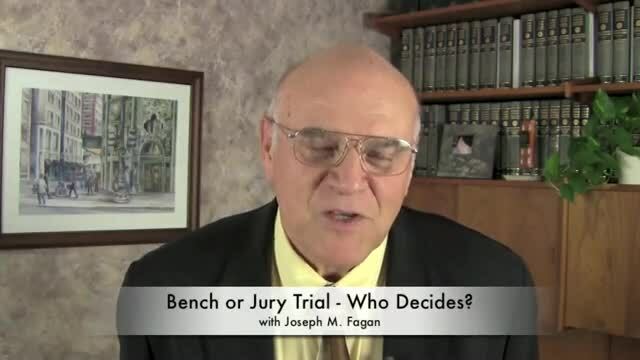 Bench trial or jury trial - who chooses? One of the questions that we are frequently faced with in the defense of a criminal case is the question of whether or not there should be a jury trial or a bench trial, and who chooses whether to have a bench trial or a jury trial? Hello, I'm Joe Fagan with Fagan, Fagan & Davis a criminal defense firm. You've been arrested, you've been charged. You've posted your bond, you've hired a lawyer, you have made the decision with your attorney that this case, your case is going to trial, that you're not doing a plea bargain. Now the question comes, what kind of trial? A bench trial is a trial with one person, the judge. Hears all of the evidence, all of the legal issues and makes his decision, now that standard of proof is beyond reasonable doubt, but it's one person who makes all of the decisions in the case. The alternative is a jury trial, a jury trial is where a constituted jury, which you help choose. Listens to the evidence and determines the facts of the case. Judges always makes the decisions on the legal issues. Why the distinction? Because in a jury trial that panel, those jurors have to unanimously agree that the evidence against you isn't proven beyond a reasonable doubt as to every element of the offense. And there's the difference, is it one person or is it a panel of 12 or in some cases six that makes that call. Who makes the decision is very clear it's set out in the constitution itself. It is a right that is uniquely yours to wave or not to wave. In fact the presumption is you are going to have a jury trial, unless you openly wave that right. You wave it by filing a document in open court after the judge has made sure that you understand that right. It's one of the most important decisions there is to make, there is no discussion on that whether it is in your favor or whether it's not a good thing to do should be made with a confident attorney who has experience in that field. Thank you for joining me I'm Joe Fagan with Fagan, Fagan & Davis. If you're facing charges like this, if you need help in this kind of an issue, please call us at the number below. Again, thank you.